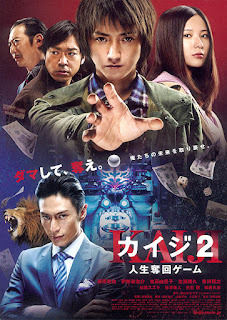 Title: Kaiji 2: Jinsei gyakuten gêmu. Cast: Fujiwara Tatsuya, Yoshitaka Yuriko, Namase Katsuhisa and Kagawa Teruyki. 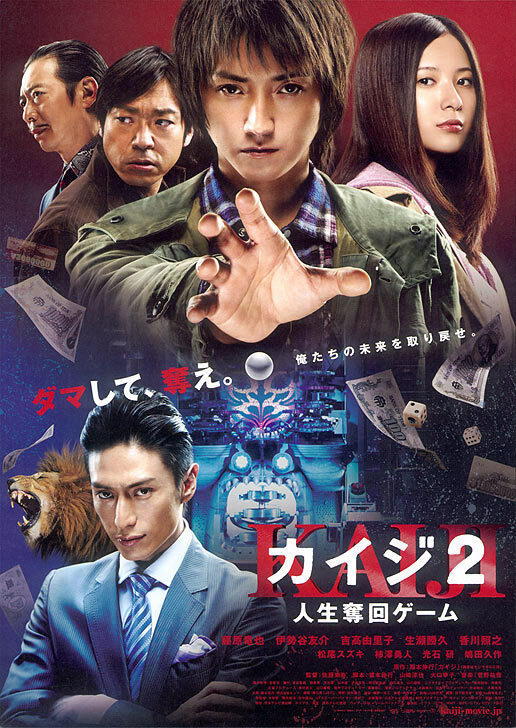 Even though he managed to pay all his debt, Ito Kaiji (Fujiwara Tatsuya) ends back underground after falling into debt again. With the help of fellow underground workers, he earns enough money to get back over ground for 14 days, where he plans to earn 200 million to get his and the rest 25 workers freedom back. Honestly, it’s pretty good. Didn’t really expect enjoying it as much as I did; I was nervous and excited some of the time. I remember watching the first one and liking it, but it wasn’t really that thrilling, okay yeah the bridge scene is insanely tense, but else, not really. I honestly felt on edge most of the time, though it wasn’t all that ‘tricky’, it had moments of brilliance. And I think what I loved most about it was Kaijis character: most humanlike ever! Kind a cool how Fujiwara can change from crazy to sad and then pathetic, then all happy, and lastly crazy once again.. Endless circle! I think I might like the first one better than this one. Even though the first one was more complicated I think, it still had more action, more going on. And it was more exciting for me. Here it was a bit too much of him taking on a whole lot of dept as if it didnt even matter anymore. I was getting annoyed instead of him lol, feeling for him, taking all that responsibility for other people and risking it all and then losing time after time. I felt almost worse than he looked. More than getting angry I was getting annoyed. But again seeing him in all these different roles it really shows what a good actor he is. And if you have watched the first then this one is really recommended to watch too anyway. OMG!!! I feel SOOO bad for him for constantly getting tricked out of his money! I really wish he could have gotten rich because he certainly deserved it! It really makes me frustrated that the movie had to end like that! It was still happy, but seriously! Give him a break! Also, I got seriously angry at Hiromi Ishida! She pissed me off so much! Anyways, both movies were about the same, unlike Battle Royale. I really need to watch something with a more satisfying, clichéd happy ending.